We have butterflies! 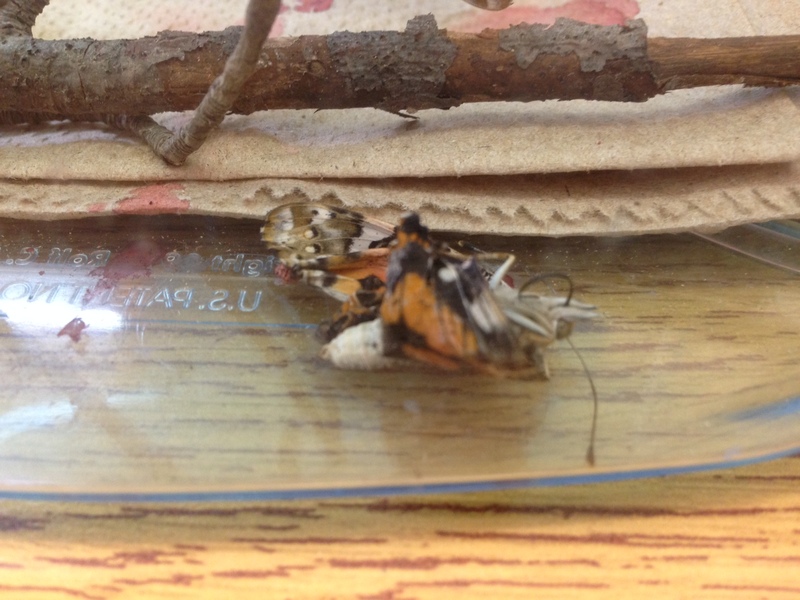 Yesterday our first pupae came out of its chrysalis. It split open near the bottom and the butterfly reached out with its legs and grabbed the outside of the chrysalis. The head came out, and then the body (abdomen) and wings. It only took a minute. It was fast. We thought it would take a long time. There was a problem though. The chrysalis was on the ground because it fell. There was a lot of red stuff on the bottom of the terrarium. We thought it was blood. Her wings got stuck to the bottom of the terrarium and we think she is going to die. We think this because we learned that the wings need to dry and her wings are stuck. And if she is stuck she can’t get to her food. This made us sad. 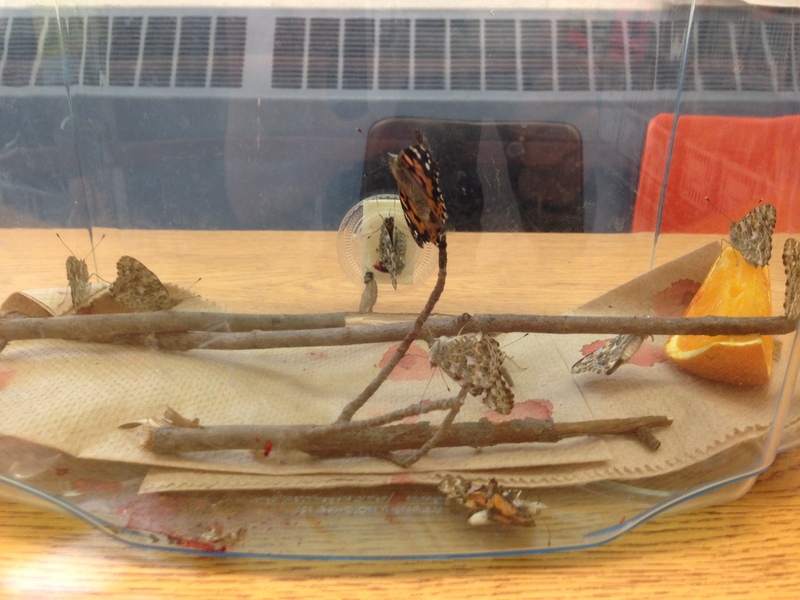 Today more butterflies emerged from their chrysalis. After we observed our butterflies we decided we needed to do some research. We didn’t know what to feed them and we thought they would be hungry. We also wanted to know what the red stuff was all over the bottom of the terrarium. We learned that butterflies eat nectar from flowers, and they also like fruit. Makayla wondered if butterflies like ice cream. We think they do because they like things that are sweet. Mrs. Cassell had an orange in her lunch so we fed them some orange. They loved it! We could see their little tongue rolling in and out as they drank the nectar. It was cool. We also learned that the red stuff is not blood. It is called meconium. Meconium is a waste liquid that the butterfly gets rid of as it comes out of the chrysalis. Mrs. Cassell told us that when human babies are born there is meconium too. We thought that was yucky. 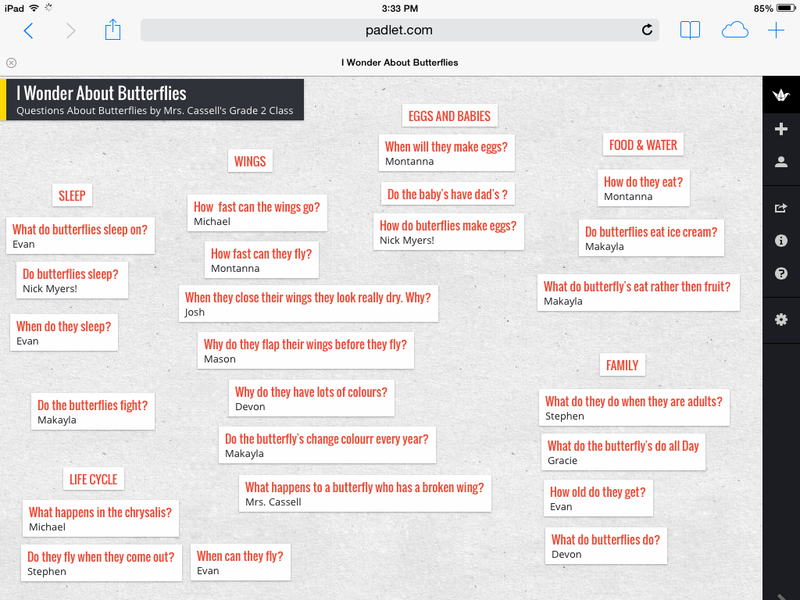 Today we used Padlet to create our Wonder Wall with the rest of our questions about butterflies. On Friday next week we get to video conference with the Butterfly Conservatory. We are so excited to ask our questions and learn even more about butterflies! It’s sounds like you are very busy learning about butterflies, how they emerge and what they need to eat. When they first emerged, did you notice their proboscis? Can you tell me what it looked like? And how it changed? Thank you for writing to us on our blog. We don’t know what a proboscis is. We think it might be something in the chrysalis, or when the butterfly comes out it doesn’t fly. Some of us think it might be something on the wing, or maybe it is part of their 6 legs. We are going to find out right now. So we went to the website PebbleGo (http://pebblego.com) and we learned that the proboscis is their tube-shaped tongue. It is black. 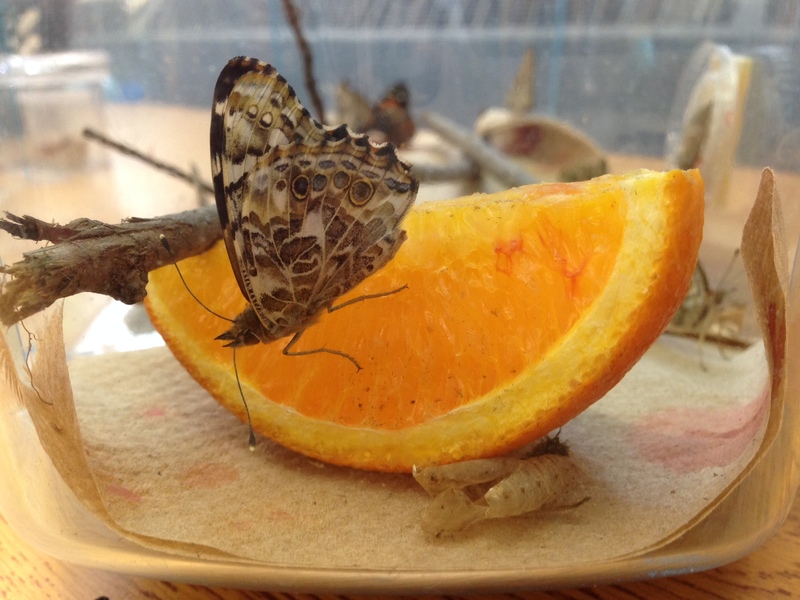 Stephen noticed that their proboscis curled up and Makayla noticed that it uncurled to drink juice from the orange. Josh noticed that they started using their tongue after they had been out of their chrysalis for about an hour which means their wings would have been almost dry. Aj made the connection that a proboscis is like a straw. Alexis noticed their proboscis didn’t come out right away. Gracie has a question: Do they have a proboscis when they are larvae? Josh’s question: What is the proboscis made of? Nick’s question: How much nectar do they drink? Aj’s question: Why do butterflies have antennae? Michael’s question: How long is the proboscis? Did we answer your questions? Can you please tell us more about the proboscis?